Poodles seem to be the most popular pets by far. Forget Paris! Thai teens and tweens make perfect hipsters, and fashion is a huge part of daily life. Seeing monks everywhere is normal, regular, every day life in Thailand. Not just in temples, either. It’s quite normal to chat with them on the bus, see them buying iPods, carrying laptops or on their Blackberries in traffic on their motor scooters. Though they do get special treatment, with their own sitting areas in bus stations and airports and on the bus, the seats in the last row are usually reserved for monks. 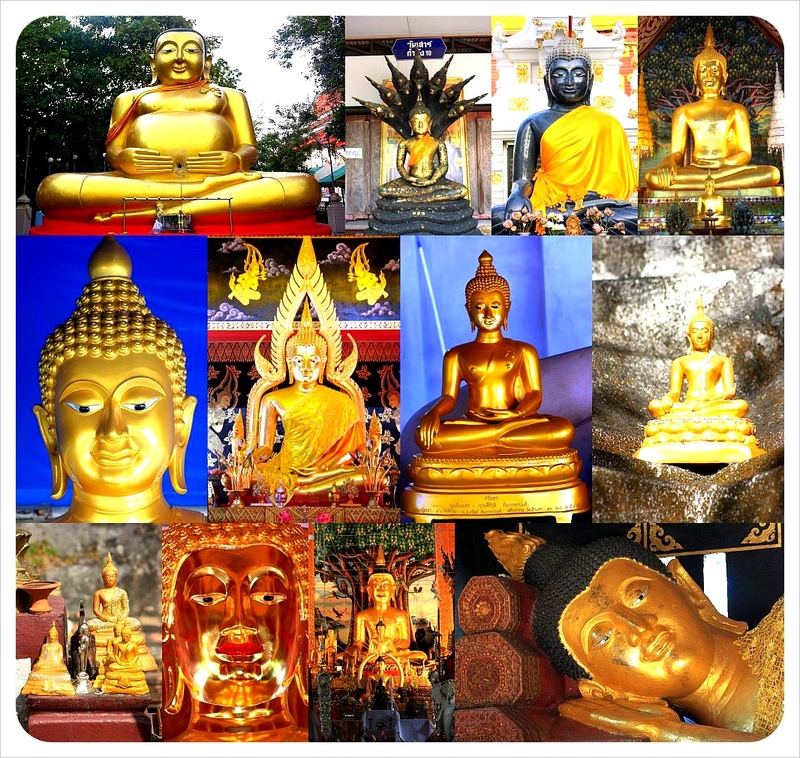 Buddhas are everywhere, too – standing, sitting, reclining. Each of the 40,000+ temples that house the Buddhas are striking and unique. Thais revere elephants. They are religious symbols found especially in temples. Real ones, however, are rare. 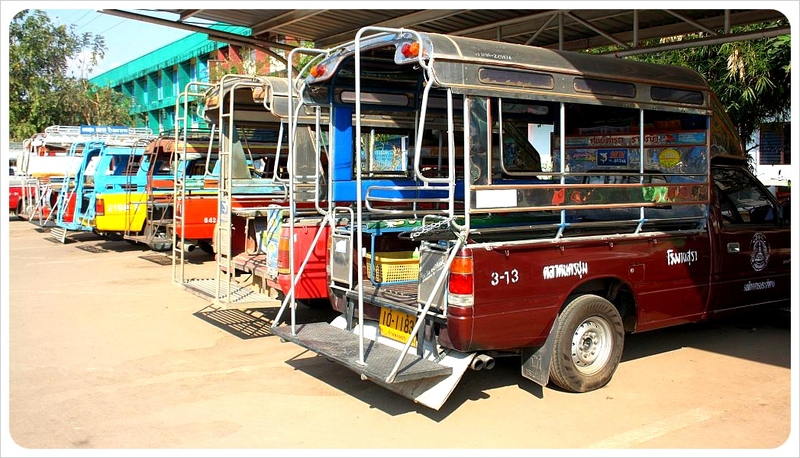 In Thailand, public transport can vary from Bangkok’s ultra-modern sky train to traditional cycle rickshaws. Thais love Foursquare! There is always at least one person checked-in at restaurants, bars, coffee shops, even temples or bus stations – they love it so much, we’ve even seen Foursquare t-shirts at markets. When tips are in English, we get great local tips this way. From modern social media to rustic gas stations on islands and in remote villages… There are plenty of ‘real’ gas stations, too. Feel like dropping out of school? Can’t be fussed to go for your driving test? Pick up any type of ID or Diploma you need on Khao San Road in Bangkok – some of these look seriously legit. We’ve all heard of Thai massage, but had no idea how seriously Thais are about any kind of massage. Foot, back, shoulders, neck, Thais love to get a massage on a trip through the market. Fish spas are a freaky but fabulous Thai institution. 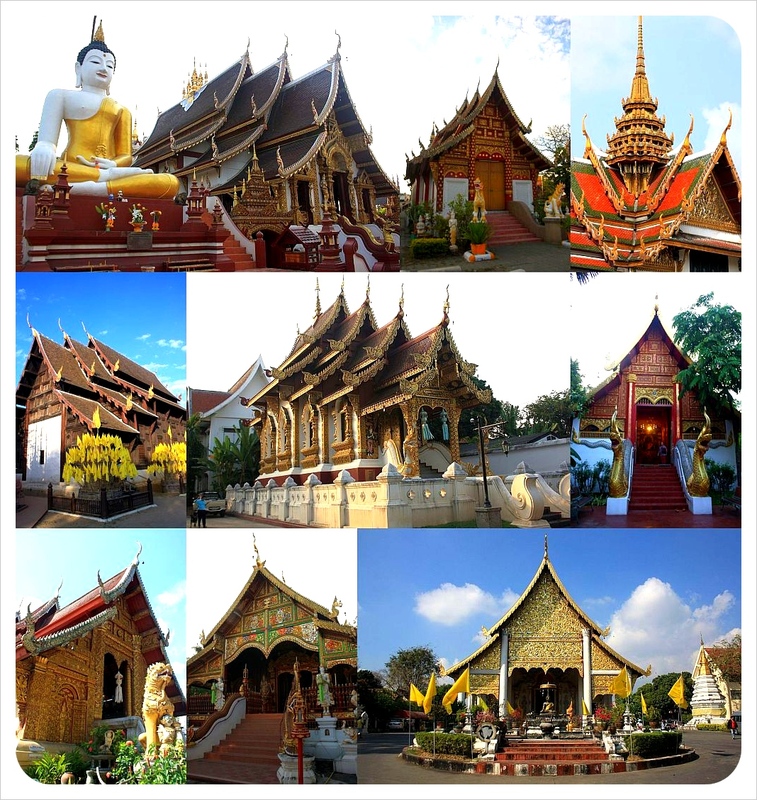 Thailand is 95% Buddhist and monks are everywhere, but there are many Muslims and mosques to see, and Islam is widespread throughout the South. Distracted by beaches or sightseeing, tourists in most countries might not even know the name of the country’s leader, let alone be able to pick him/her out of a line-up. Not in Thailand, where His Majesty King Bhumibol Adulyadej waves down from posters and billboards literally all over the place. In fact, there is also a film of scenes from throughout the King’s life played to a standing audience before every movie shown in Thailand cinemas, too. ‘The Beach’ is not the deserted dream destination that it was when the movie was filmed there. 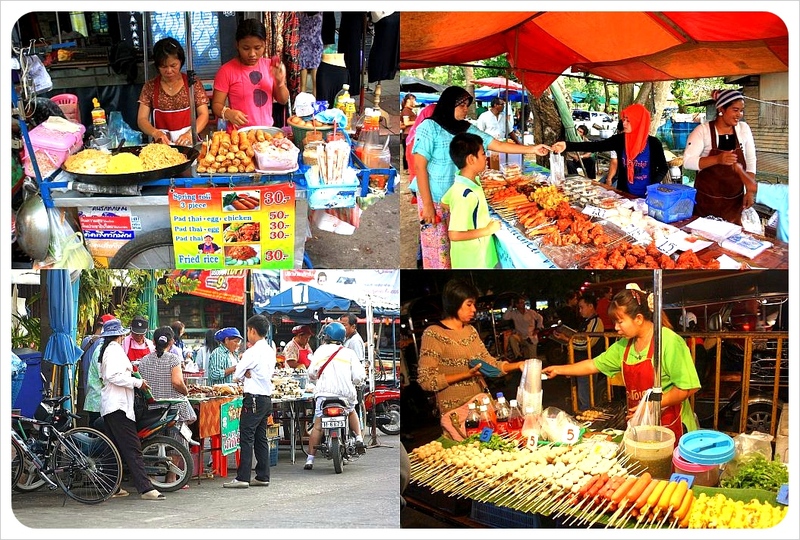 Morning, noon and night, Thais either eat or pick up nearly all their meals at markets. Wouldn’t you, if all your take out food was guaranteed to be healthy and cheap as chips? If you pick up your dinner at the market, you get the hot food (or salads, or fruit) in little plastic bags. Whether at the market or in a restaurant, Thai food is so delicious, we order it three times a day. Who needs cereal, when you have this? How donuts found their way into Thai cuisine is a mystery, but there is not a single mall without a (Mister Donut, Dunkin Donuts) donut shop. We are still not sure why, but birds in cages hang in front of Thai homes, stores and in temples. Thais love energy drinks in tiny brown bottles. 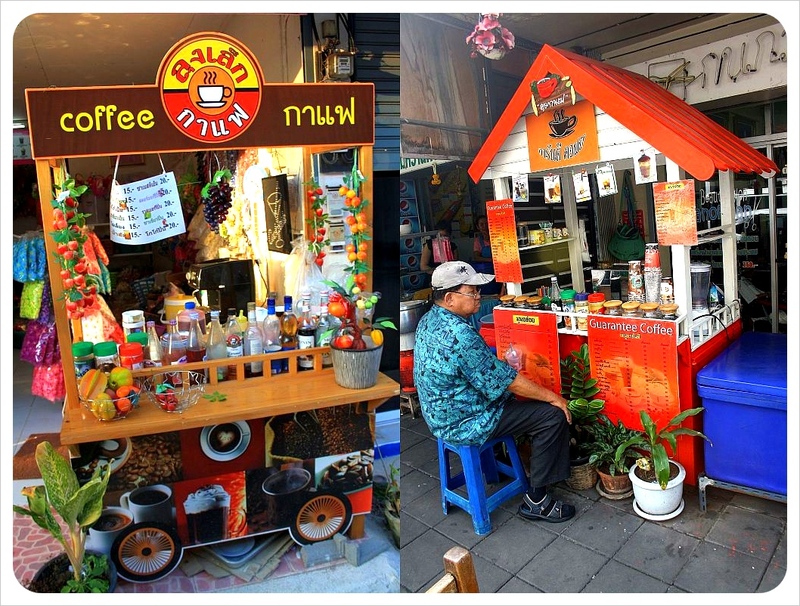 Thais also love their coffee! From coffee shops to road-side stands, the coffee is excellent and there is almost always free wi-fi (and that is enough to make us want to live here). Thais live in the future. Seriously – 543 years to be exact. According to the Buddhist calendar, while we ringing in 2012, Thailand was celebrating the year 2555. Most towns in Thailand have unique, golden street signs and traffic lights with interesting statues. Our language skills have been seriously tested – how to learn to speak Thai, when written it looks like this? 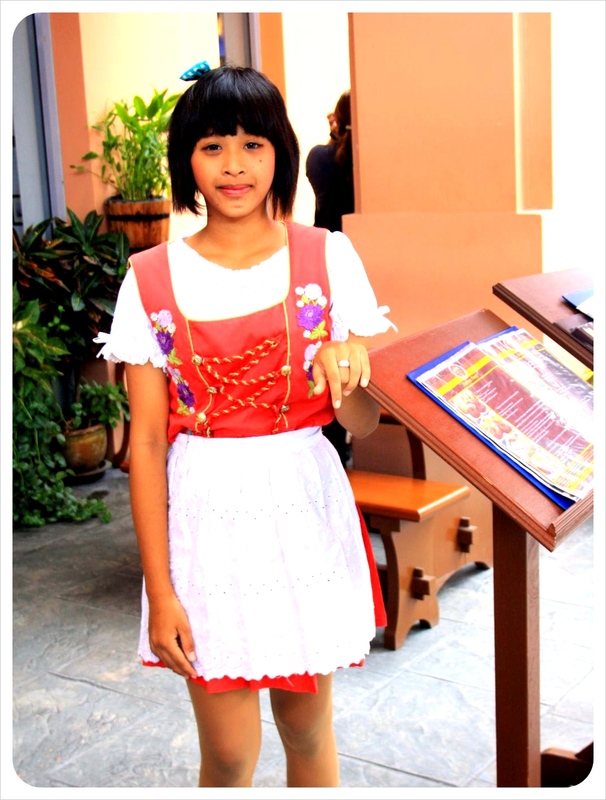 We can wholeheartedly conclude that a Thai girl wearing a traditional Bavarian dress is just wrong – especially because she worked at an all you can eat Bavarian beergarden in Phuket, which is also just wrong. Thais refer to foreigners (white Caucasians) as farang. It might sound offensive (like being called ‘cracker’ or hillbilly) but the term is a fairly neutral term for a westerner. Fancy eating bugs? You’ll find fried insects in many of the markets. You could play it safe, though, and eat at Mickey D’s, where even Ronald McDonald greets you with the traditional Thai Wai. Like in Latin America, the electrical wiring leaves much to be desired. Also like Latin America, soda drinks often come in plastic bags, but here in Thailand, the bags are branded. Thailand’s reverse osmosis water filtration system makes hundreds of these re-fill stations available with fresh, filtered water for as little as 1 Baht ($0.02) for two liters. Selling pirated DVDs of brand new blockbusters or unlocking iPhones is not just reserved for the streets, this is also commonplace in major malls. So far we are loving finding out these great quirks about Thailand – a place that used to feel so far away, but has come to feel so familiar. Please share your observations of Thailand in the comments below, or let us know if you have any questions about planning a trip here one day – we would love to share a few tips about traveling in Thailand. Seriously loved this post! What a great way to summarize your first impressions. And since I’ve never been to Thailand, there were so many new things for me to learn. I so wanna go… now… and NOT only because of the food pics 😉 Yummy! Would love to spend more time in Asia, in particular Thailand or Indonesia actually. Marco and I have family in Guangzhou and we just spent a good week there over New Year’s. It was fun, but I’m ready for new places as we’ve visited them a few times already. Our plan is to convince our family there to meet us somewhere in Thailand or Indonesia next time we go visit them 🙂 Are you planning on being there for a while? I like the idea of starting in a city and then going to relax somewhere pretty. Maybe a beach. I heard scuba in Thailand is great, so I’d love to give that a try. Do you know if the eastern or western coast is better for that? Headed to the post right now 🙂 Thanks! Loved this post. So interesting seeing all those pics… pictures really so say a thousand words, don’t they. They sure do guys, but not as much as getting up, getting out, and getting on a plane to a new place! I remember when we saw the bunch of dogs in the motobike’s basket in Chiang Mai! Hey chicky! Great to hear from you! Awesome you remember the dogs in the basket 🙂 Glad to hear Oz is treating you well. We are really liking Malaysia so far – just in KL for now, exploring the rest in a little over a week. Great Pics, interesting observations, I love Thai people! Hey Jan, at first – during our we’ve-keep-getting-scammed-in-bankok phase, we did not understand what everyone meant about how nice the Thais were. And then we discovered just how friendly, helpful and playful the Thais really are! Thanks for stopping by! I lived in Thailand for a year (OMG, 7 years ago already!) and I give you both a whole lot of credit – I had the same impressions/expectations too! It is an amazing country to visit. I do not know if I would go as far as to claim it is a great country to live and work in… but it is certainly in an adventurer’s “Must See” places list. When are you girls planning a trip to Colombia, in South America? If you make it to the Caribbean Coast during the summer (July 18-15), I would be very glad to be your tour guide! Hi Nat, thanks for commenting! There are certain aspects of life in Thailand that are really great – prices, food quality and variety, medical care, great internet connection, laid back lifestyle, good natured people…but we do have the travel bug and won’t be settling anywhere any time soon 🙂 However, we ARE going to be in Latin American later this year (but not July, later than that), so if you are around, we’d be happy to meet up! The girl in the Bavarian dress looks uphappy. Oh yeah, she was…I mean, she’s like 15, how can she possibly identify with what must just feel like a silly foreigner costume…but I think we all hated our jobs at 15, or any job where you have to wear a uniform (unless you’re a pro athlete or something like that). We just got back from Thailand and your post completely sums up our trip in a most eloquent and concise fashion. After reading it, my reaction was “Yup, that was Thailand, to a T.” Thanks for putting this together and helping me to relive our trip! Great post, guys! I learned a few things about Thailand myself! I had no idea those “rustic” gas stations existed, or that donuts were so popular there! When we first got to Ko Lanta, we started seeing these gasoline stands outside of stores, and then anytime we are in a slightly rural location, we spot them now. Glad you learned new things about Thailand…we can’t wait to return to discover more! Oh seriously Deej, not at all – if you have a donut addiction, or a cupcake addiction for that matter, you can develop it further in Thailand. Dani even discovered Sushi shaped donuts – they come in a sushi box, even. Kim – you definitely need to come this way! It seemed so far away to us, and then we just got on a plane and here we were. Easy as pie (and relatively inexpensive at $600 a person). If you do come this way let us know and we’ll definitely give some tips! Aw, thanks Jade. 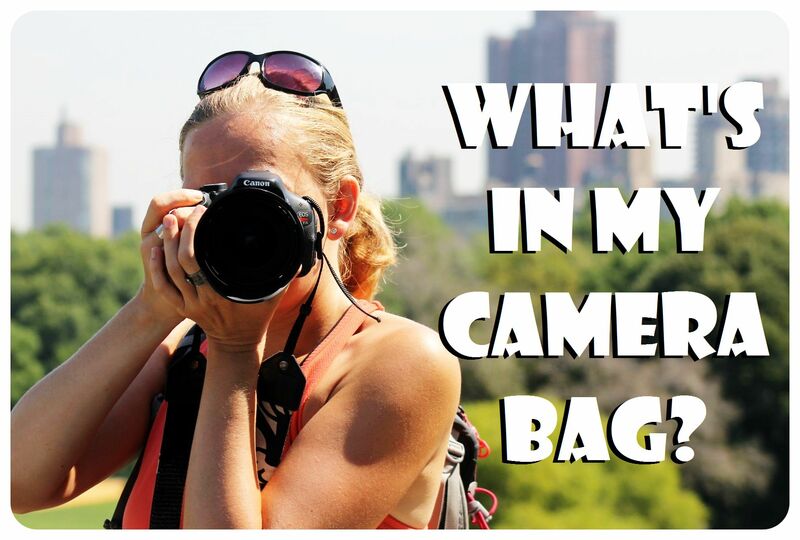 Dani takes hundreds, thousands of pics – it was tough to boil it down to one post! Hey Lauren! No one said you had to leave – and after India you can always come back! You both have a great eye for the unique. In particular, the stop signs and traffic lights. I hadn’t noticed those at all. I like this photo journal wrap-up. Thanks Fidel, I didn’t know we were noticing something unique! 🙂 Glad you enjoyed the wrap-up…Don’t worry, Thailand will still be there for next time (at least we hope!). I love this post! Soda drinks in plastic bags? Now that’s a first for me! Every Saturday I see people driving by on their bikes with those cages, all heading to a big field where they hang the cages on these metal poles and stand and stare at the singing birds. I do not get it. Thanks so much for explaining the birds in cages!! We have to look out for these singing competitions! For some reason, I have an aversion to the beverages and take out orders in plastic bags. I just can’t do it, ha ha. Have you had any take out from a plastic bag yet? Wow, this post bring so many good memories. I have been only to the Northern part of Thailand (haven’t visited any of the islands). However, I identify with many of your first impressions. Just makes me want to go to Thailand again. Thanks, Ruth! We have been to quite a few places in Thailand now, but we haven’t made it to any of the islands in the Gulf of Thailand yet – there is so much to see in Thailand – we know already that we have to come back for more! The motor-scooter photos are crazy!! Wow! I’ve always wanted to go to Thailand, but you have seriously piqued my interest. The food looks amazing, and it looks like there’s so much to see. Great pics, looking forward to reading more! 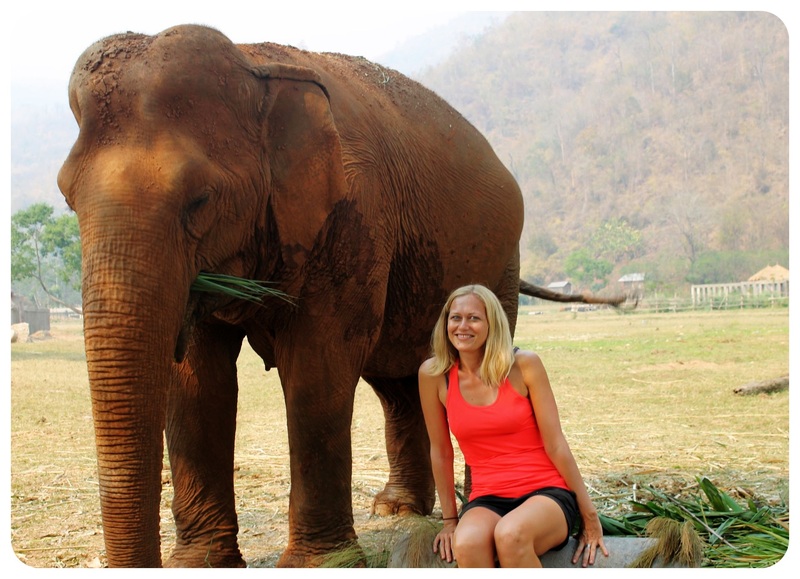 Liz – the food is definitely one of Thailand’s highlights!! So good, and so cheap! Loved this post, made me really miss Thailand. Loved your pictures too! Incidentally, we camped overnight on Maya Bay and it was a way better experience than being there with the crowds. Waking up to the silent, empty beach was amazing. Will put the post about it on here when I finish it:) Loving the site, BTW! 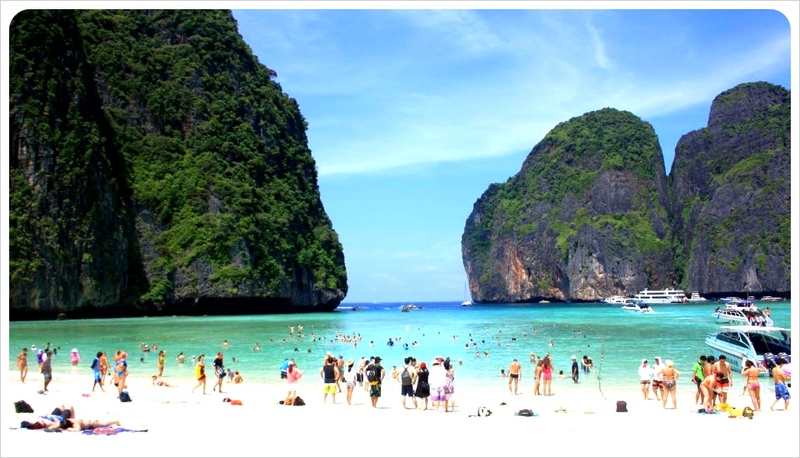 The camping on Maya Bay sounds amazing – we should’ve opted for that, too, I think. Send us a link to the post when it’s live – you can read about our experience at ‘The Beach’ shortly here, too. I love this post! I really like the way it’s laid out and written- really simple to read. It made me laugh and smile thinking back to our good memories in Thailand. Love the pictures of Thai fashion! After being in Asia for eight months, I have to say the fashion here is just as dynamic and interesting as things I have seen in Europe. And so many hipsters! It’s a worldwide phenomenon! Interesting to see how the bottle deposit / recycling works in some countries. Thanks Inge – coke in bags is definitely still more prevalent in Central America than here, we just love finding these little details that are similar around the world. They use the same tubs of washing up soap, have the same silver sinks…but what we do like a bit more about Thailand is that there are, at least on paper, recycling and no (styro)foam initiatives that you just don’t hear talked about in Honduras or Nicaragua. This article is sooooo Thailand, lol, luv it! See you girls tonight! Thanks Dina 🙂 It was great meeting you and Ryan!! I love all these pictures – it looks incredible!! I must say I have always been wary of Thailand just because of the seedier side of it, and i get the feeling you may be treated badly as you are a tourist. I have heard a few horror stories! That’s not to say Thailand isnt an amazing, beautiful place to visit! Duncan – we definitely got ripped off in some place because we are tourists, but we’ve also experienced the complete opposite in other places where people were genuinely friendly and happy to show us their lovely country. Just spent a week in Phuket relaxing on the beach, followed by 5 nights in Bangkok. Tonight we depart on an overnight train to Chiang Mai. I’m ready for a little relaxing again!